It is a good thing there are now more than 50.1 million Hispanics in this country, so that companies unable to grow their brands among healthy-minded Americans can now turn to the so-called minorities to peddle their fast foods and sugary drinks. Take Kraft’s Kool Aid, which this month announced it will devote most of its advertising budget against U.S. Hispanics. 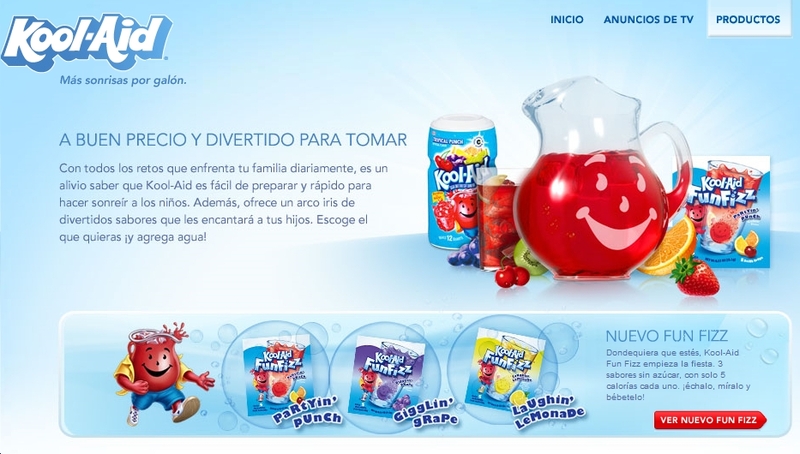 Kool-Aid, in a first for any Kraft brand, has allocated the majority of its 2011 marketing budget to reach Hispanics. Television commercials that began running this week on networks including Univision and Telemundo feature families drinking the beverage at festive occasions. The Spanish-language pitch goes beyond the convenience of dissolving some powder in your glass of water. Kool Aid, says this advertisement, will actually help your children have fun…. And if everything goes according to plan, they will soon qualify to take part on the upcoming Hispanic version of The Biggest Loser. This entry was posted in Food, Marketing & Advertising and tagged Hispanic marketing, Kool Aid, Kraft. Bookmark the permalink.